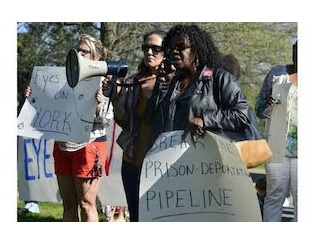 Connecticut was one of many states and cities around the U.S. that raised money and awareness to bail women out of jails and prisons for Mother’s Day this year. The Connecticut Bail Fund, working with a dozen other groups, raised about $30,000 and bailed out 30 women. The funds were used to bail out 26 women from the state’s only women’s prison, York Correctional Institute in Niantic – and another four from immigration jail. While these women are charged with crimes, they have not been convicted and are incarcerated only because they can’t afford to pay bail. The groups participating in the “Mothers Day Bail Out,” as it’s called, are not simply raising money to release women from jail, but are challenging the entire money bail system, which discriminates against the poor, the population most often caught up in the criminal justice system.